It’s been hard to spot a headline lately that doesn’t include the words activism, protest, boycott or social justice. Some conditions have improved, but racial tension and pleas for equality prompt plenty of unanswered questions. To help find answers beyond the headlines, sociologist and civil rights activist Harry Edwards and San Jose State University (SJSU) launched the Institute for the Study of Sport, Society and Social Change on Tuesday. The kickoff event, held on SJSU’s campus, featured Jim Brown, Kareem Abdul-Jabbar, Tommie Smith, Takeo Spikes, Chris Webber and Anquan Boldin, along with The Undefeated’s editor-in-chief, Kevin Merida, senior NBA writer Marc Spears and others. Two panels discussed what modern activism looks like, and how protest can be turned into progress. Panelist Danielle Slaton, a former member of the U.S. women’s national soccer team and current sideline reporter for the San Jose Earthquakes, said she hopes that athletes use their platforms to pursue change. Sports columnist Ann Killion agreed, but said activism is something that can’t be forced. Former U.S. Olympian Tommie Smith (right) speaks as NFL football wide receiver Anquan Boldin listens during a sports and activism panel entitled “From Protest to Progress: Next Steps” on Jan. 24 in San Jose, California. The panel of athletes, including Brown, Spikes, Abdul-Jabbar, Webber, Boldin and Smith, addressed the point of view of athletes who have been spoken out against social injustice. Abdul-Jabbar believes the power and influence athletes possess are enough to raise the consciousness of those who look up to them. For instance, it was NBA Hall of Famer Bill Russell who led Abdul-Jabbar to find his own voice. 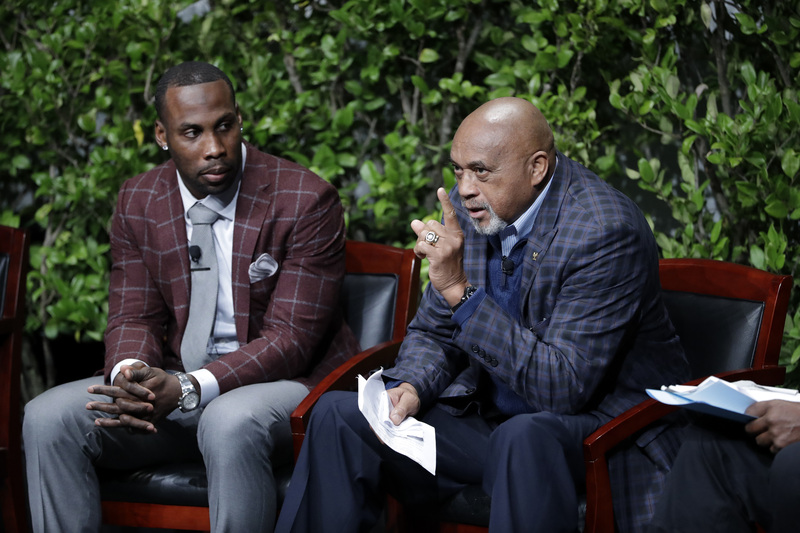 Boldin, a veteran wide receiver for the Detroit Lions and the panel’s only current athlete, said that players who fear fan backlash or losing endorsements for speaking out should look at the bigger picture. 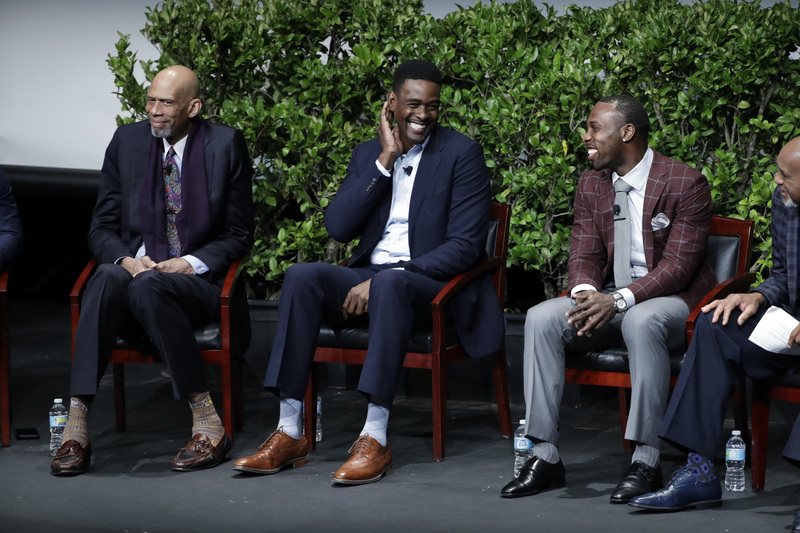 From left to right: Former NBA basketball players Kareem Abdul-Jabbar, Chris Webber and NFL wide receiver Anquan Boldin smile during a sports and activism panel entitled “From Protest to Progress: Next Steps” on Jan. 24 in San Jose, California. Smith reflected on the similarities and differences from his time as an activist in the 1960s and activism today. Smith wants modern athletes to stretch beyond themselves and the fear that keeps them from speaking on issues they strongly believe in. The former SJSU track and field star was grateful to be back on the grounds of a place he calls home. In the center of the campus stands a 23-foot-tall statute of Smith and teammate John Carlos made of steel, fiberglass and colorful ceramic tiles. The two men stand frozen atop an Olympic podium, heads bowed and fists to the sky — a silent protest during the medal ceremony of the 1968 Mexico City Games that led to their suspension by the U.S. Olympic Committee and expulsion from the Olympic Village. The statue represents a movement and fight that continues today. With the founding of the Institute for the Study of Sport, Society and Social Change at a university with a rich history of social activism, Smith hopes that he’ll be around to see the impact he knows the institute will make on society.